There’s still plenty of time to get those last ACs in activities. We had a long discussion at lunch about how today was the last turkey dinner until Thanksgiving. Wait, WHAT? The last turkey dinner? That means tonight is the last Sunday Night Sing, and tomorrow is the last Monday (and so on). And while it’s true that we are verging on five days left of actual camp, Andy pointed out in Sunday Assembly (also the last) that we still have a quarter of second term left. Plenty of time for boys to accomplish new things in this summer of ’13. In fact, in the past few days my kid accomplished two of his goals for the summer: to drop a ski and to climb to the top of the Clubhouse chimney (don’t mind this proud mama). But he’s been working on these things since June 23. Can you imagine? I watched that boy climb that chimney dozens of times this summer. Dozens. When was the last time you saw your kid try, fail and try again? And AGAIN? And again. (and so on). To me, more impressive than the actual accomplishment, was the effort. Perseverance. Grit. I’m lovin’ it. And trust me, it’s happened to your boys, too. The past few days have been cool and beautiful. Of course we wish it was 78 and tanning weather, but I guess I ought to be celebrating I’m not at home in Gainesville, FL where it’s 97 every day. The boys have been amazing. In fact, you’d never know it was chilly. They’ve been running, playing and swimming every day. This coming week starts to get a little crazy, so I’ll give you the run down on what’s going on, that way in case I can’t knock out as many blog posts as I’d like, you’ll still have a sense of what’s going on. Monday and Tuesday there will be several open activity periods so that boys can choose which activities they’d like to go to. That way if they’re really close to graduating tennis (or riflery or whatever), they’ll have the chance to get the last ACs (achievement credits) necessary. On Tuesday, we’ll have our last Division Day. Everyone will be in camp, and I’ve heard from reliable sources that the Juniors will be having some sort of Survivor Day. I’m hoping someone will tape it and make it into a movie for….. Stunt Night. Which is on Wednesday evening. As many of you know, Stunt Night is the Highlands version of a talent show, however, history has proven that one needs not talent to perform in said show. It’s always a laugh. Thursday is the Kerchief Ceremony, a solemn, lovely ceremony. And then of course it’s Friday. The noon meal will bring with it the Honor Tripper awards, and starting at 3 p.m. is the Water Carnival and family picnic and banquet. We love being able to share some of the camp spirit with you during this last day. In our eyes it brings a sense of closure to this remarkable experience your boys have had. They have grown so much, endured cooler temps and rainy weather. Blazing heat and pretty much the worst mosquitos I’ve seen in my 15 years up here in the North Woods. This night gives everyone the opportunity to process the summer. And when your son mopes around for a week or two as he readjusts to “the real world,” you’ll have a good idea of what it is that’s happened to him these four (or SEVEN) weeks. And of course, in my opinion, the best thing is hearing Mike read “Goodnight Little Cabin.” That coupled with the last Taps is magic. Don’t worry, I’ve still got a post or two left in these fingers this summer. I’m still processing the INCREDIBLE Sunday Assembly this morning where we heard from long-time Highlands men express their love for Highlands. Let me just say there wasn’t a dry eye in the house. But that’s another story. 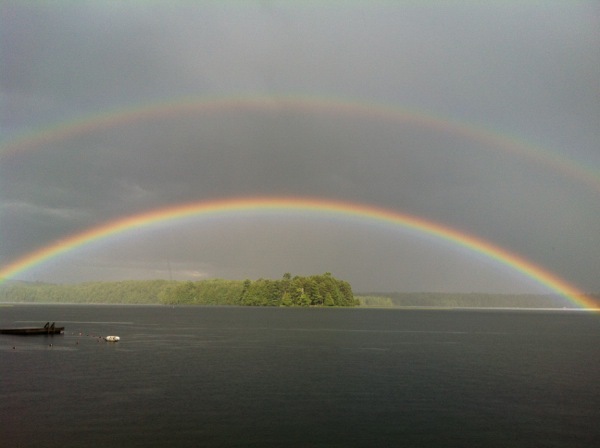 As many of you saw, we were graced with an incredible perfect double rainbow on Wednesday afternoon. To date, the photo we posted on Facebook has garnered the most likes and shares of anything we’ve ever posted. While it’s a great photo, I didn’t think it was THAT good. It kind of got me thinking. Why? Why was that picture such a hit? 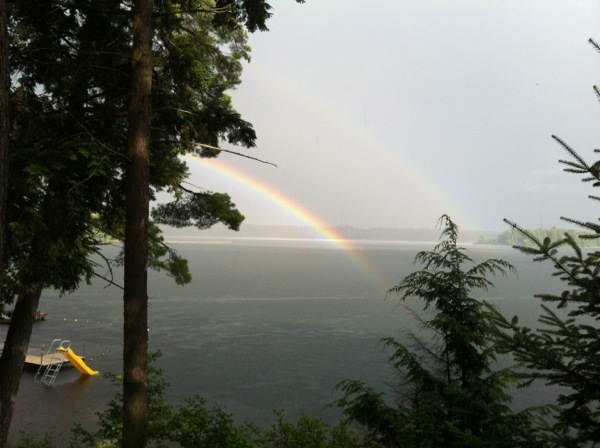 The rainbow started in my front yard and moved to the Cub/Colt ski pier. I have to tell you, what you don’t know about that photo is that when I walked into my living room with a feverish and sleepy toddler in my arms, it looked like that rainbow was IN MY HOUSE. Both Remy and I started hooting and hollering, and I dashed out into the rain shower without shoes. By the time I got to the end of the dock, I was literally standing in the end of the rainbow. While there were no leprechauns or pots of gold, I did feel like I might get sucked into Narnia or whisked off to Hogwarts. I flipped out. I absolutely sounded like that guy Hungrybear9562 on YouTube. 1. We are so plugged in it aches. Screens and images and the hum of the computer follows us everywhere we go. In this day and age, finding a quite spot to appreciate the abundance and beauty of this world in which we live is increasingly difficult. That we know over 110 boys and young men are running and playing and yelling and getting dirty in this wide, wide natural world – right this minute is reassuring. Even if we can’t sit on the lake shore as the perfect rainbow-making storm rolls by, our future fathers, husbands and leaders ARE. 2. Camp is a moment in time. Those rainbows came and went inside of ten minutes. Just like moments of refracted light slip quickly by, so to do these precious moments of summer and, indeed, these precious moments of boyhood. I am particularly sensitive to how fast this time goes by. We recently had a former camper and staffer visit Highlands who is now a crew chief flying around in helicopters for the US Marine Corps. I have photos of him as a 9 year old rolling around on the ground with our old dog. It seems like yesterday! 3. Rainbows are LUCK. They are filled with symbolism. And despite being a pretty unsentimental person, the fact that I danced in the end of the rainbow on Wednesday is soaked in meaning. We are SO lucky. Lucky to belong to this community. Lucky to be under the careful and loving wings of Mike and Sharon Bachmann who make this whole thing possible. Lucky to have happy and healthy boys. Lucky to have the support of families near and far, spanning the decades. But mostly lucky to be here now. 4. People loved that photo because it reminds them that there is something incredibly magical about Highlands. 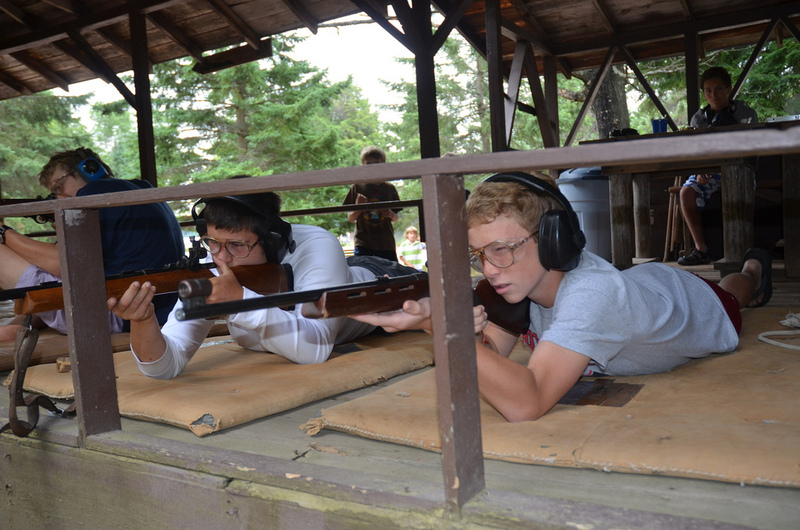 A summer at CH is not just learning to throw a perfect spiral football, or dropping a ski. It’s about building a special kind of inner strength. One all their own, without moms, dads or siblings to help or hinder. It’s about how they may leave Highlands, but Highlands will forever be in their hearts. That perfect double-rainbow is a metaphor for this experience. Gorgeous and fleeting. 5. With just a week left of summer 2013, I’m left feeling full. Full of excitement for what your boys will come home with; stories, jokes, tans, a certain calmness after a summer of running amok. I’m feeling full of purpose as an administrator and communicator. Full of refracted light and full of luck. This was the best shot I got. Mainly because I was so excited I didn’t notice my finger was in EVERY other photo.